My lovely friend Bidisha Sinha, writer of Glistening Kaleidoscopic Eyes, did this amazing, flirty and girly day time smokey look using pink and purples perfect look if you want a break from your everyday neutral shades. 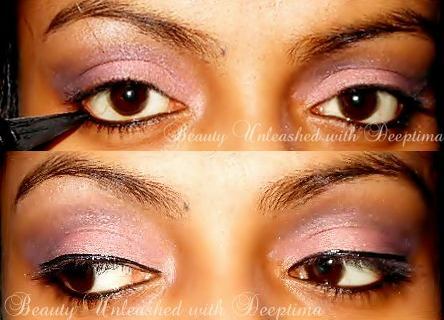 To see more of her looks, product reviews and online shopping hauls do visit her blog, Glistening Kaleidoscopic Eyes. 1.I am first taking the flesh coloured cream eyeshadow from Revlon Illuminance creme eyeshadow palette in Pink Petals & applying on the eyelids. And we are done !!!!! Chambor lipstick in Rose Fresque. you look gorgeous hun !! <3 Thanks for the post ! !